This project focussed on the coastal areas of Anglesey, specifically those comprising the conservation area of the Anglesey Area of Outstanding Natural Beauty. This area is largely undeveloped and of great landscape value for its scenic qualities and its flora and wild-life. It is also an area of good climate and soils that attracted settlement early in prehistoric times, most notably by the earliest farmers in the Neolithic period but continued to be a focus of farming and settlement right through history. The continuation of arable farming has meant that much evidence of the earlier settlement has been obscured by more intense clearance and ploughing from the 18th century to the present. Aerial photography in recent years by Toby Driver of the Royal Commission on Ancient and Historic Monuments in Wales (RCAHMW) and by John Rowlands and Dafydd Roberts (of the aerial survey company Pixaerial) has now begun to reveal the extent of early settlement by the identification of a number of new archaeological sites as crop marks. The current project was designed to investigate some of this early landscape by means of geophysical survey and trial excavation. It was also designed to include educational and public information work supported by a grant awarded by the Sustainability Fund for the Anglesey AONB. The first year of the project concentrated on geophysical survey of a selection of eight archaeological sites identified as crop marks. This survey provided more detail about each site, allowing a better understanding of their nature and function. These comprised a Bronze Age barrow burial cemetery, a possible Late Bronze Age defended site, two probable Iron Age enclosed settlements, a Romano-British settlement, a possible Medieval high status settlement and three sites of uncertain type but possibly Medieval or Early Post-medieval agricultural features. The second year of work was designed to investigate two of the crop mark sites where geophysical survey produced good results in the first year. The investigation comprised trial excavation to characterise the remains, provide dating and interpretative evidence and to assess their survival and potential. A second yearof funding from the Anglesey AONB Sustainability Fund also allowed further educational activities. 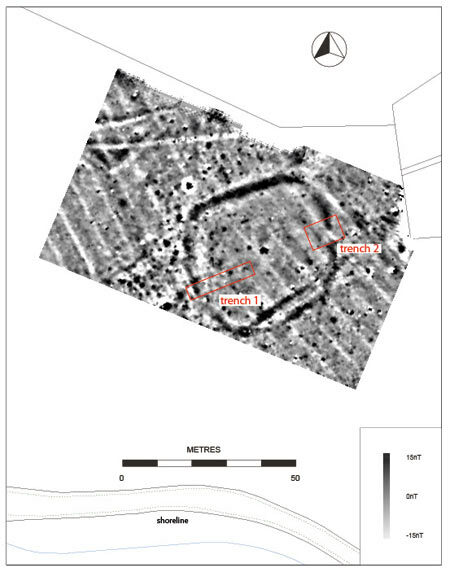 The areas chosen for the field work were a large circular hill-top enclosure at Carrog, Llanbadrig, interpreted as possibly a Late Bronze Age or Early Iron Age defended site and a probable small enclosed settlement of uncertain date at St Mary’s Church, Llanfairpwllgwyngyll. The latter was of particular interest because it is situated close to a likely boat landing place at the side of the Menai Straits and because a bronze pin of Irish Viking style of the 10th century AD, had been found close to it. 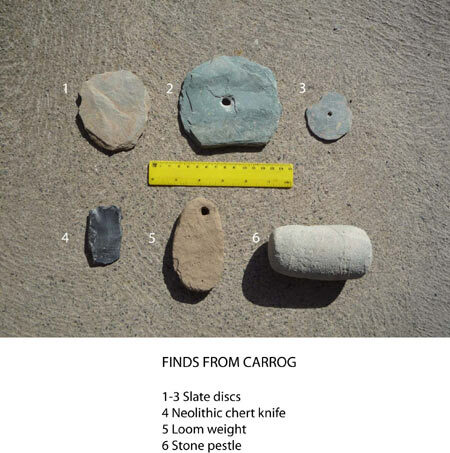 The excavation at Carrog was completed in May 2010. 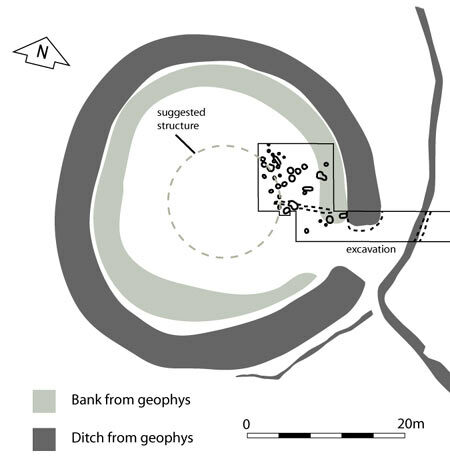 The excavation showed the enclosure ditch to be substantial, 4m wide, 2m deepand probably defensive but nothing was left of any accompanying bank. Within the enclosure were numerous post-holes and pits. Some of the pits proved to be hearths of Early Neolithic date and these produced radiocarbon dates in the 4th millennium Cal BC. They represent use of the hilltop as a camp-site long before the enclosure was built. There was little artefactual evidence for the occupation of the enclosure itself but radiocarbon dates from post-holes and from the ditch indicate that it was constructed about 800 Cal BC and occupied until about 400 Cal BC. The original interpretation was therefore confirmed, making the site one of great archaeological interest. It was built at a time when defensive enclosures of any type were a new feature of the landscape. It probably contained the dwelling of a local chief with a dependent farming community in the area around, living in scattered houses. One theory is that this type of site was developed as a centre where communal cereal grain could be securely stored. Late in its existence, after it had largely silted-up, the enclosure ditch was partially backfilled and a small rectangular building constructed within it. This was probably a small house and was associated with a rotary hand quern and a stone loom weight and has been radiocarbon dated to the 8-9th C Cal AD. 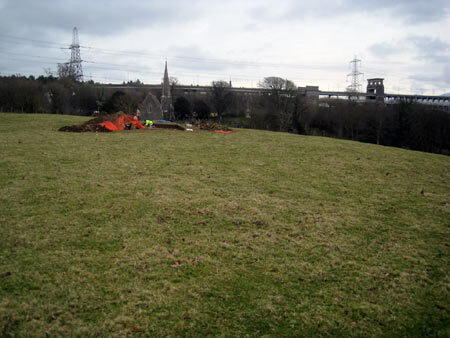 The second trial excavation at the enclosure at St Mary’s church, Llanfairpwllgwyngyll was completed in February 2011. Two areas of the enclosure ditch were excavated as well as the entrance and part of the interior. The excavation produced no datable artefacts and no identifiable occupation apart from two small post-holes. The enclosure was situated on a slight natural promontory and the ditch was of some size suggesting that the site was defended. The lack of finds tends to suggest an Iron Age date but radiocarbon dating will be carried out later that should allow better understanding. Interim reports on both excavations have been produced (GAT Report Nos. 939 and 946). The radiocarbon dating for the Carrog enclosure is complete but has yet to be produced for the St Mary’s Church enclosure. Wood charcoal identification is complete for both sites but other macro-botanical analysis has yet to be completed for both sites.